On November 19th that same year it was redeployed again by the R/V Thompson. After sailing several hundred kilometers to the south, it reversed direction, sailed north, and made landfall on Long Beach Vancouver Island on the 9th of December. The miniboat Dolphin was launched off the R/V Thompson while working near the Northwest Enhanced Moored Observatory off the coast of Washington and on the 24th of May, it made landfall a few days later on Ocean Shores. February 10, 2015 – OPB EarthFix produced a 3 minute radio piece on the unmanned sailboat project in Coos Bay. Teacher “Andrew Giniger says the project came to Sunset Middle school through the Oregon Coast STEM Hub, which helps coordinate science, technology, engineering and math projects at schools.” To listen, read and see photos, click here. 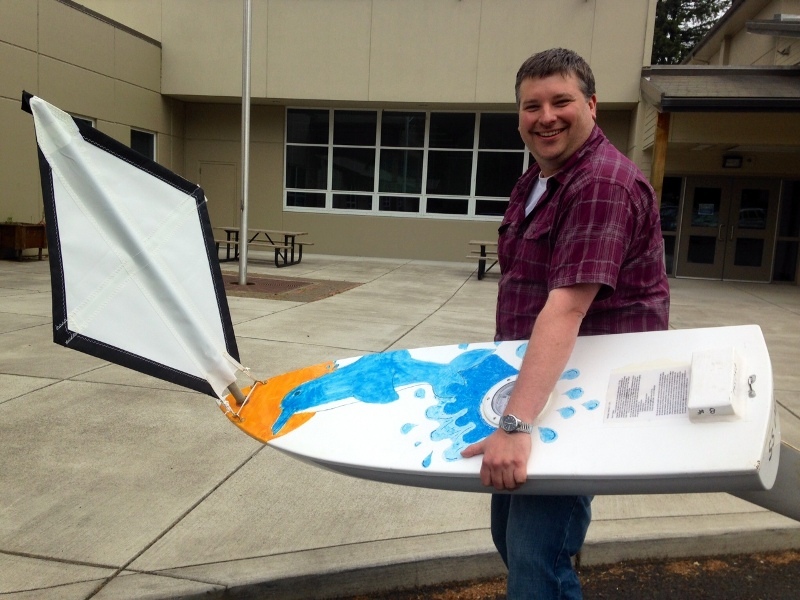 May 21, 2015 – Educators from Oregon will be taking part in a research cruise, during which they will deploy the SS Dolphin, a 5 foot unmanned sailboat built by Coos Bay students. Read more here. The SS Dolphin was prepared by the Toledo High School teacher, Ben Ewing, with some help from the Coos Bay middle school students.